Why is a small indoor heater necessary when you already have a central heating system? Because it helps you save on your electricity bill especially in instances when you don’t need to full-blast your main heater. For instance, if you spend most of the day in one particular room of the house. Or if you’re always at work and the only room that needs heating is your bedroom. In this review, find out if the Honeywell HCE322V is a reliable indoor heater. 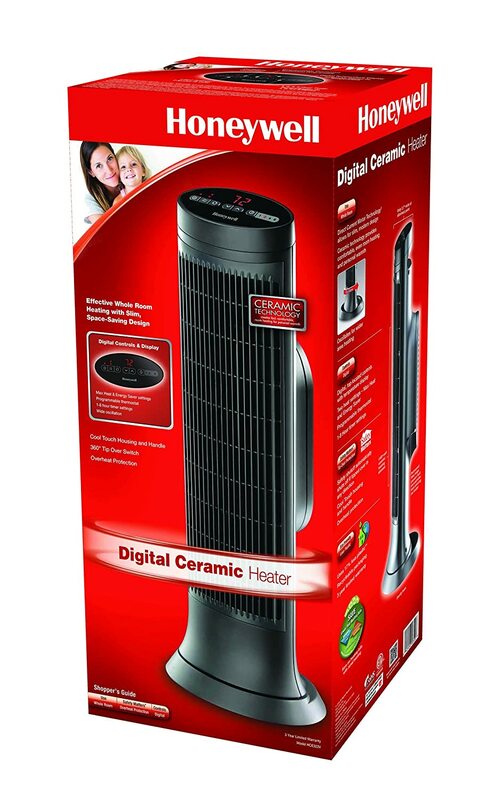 This tower heater has a ceramic heating element, comes with a digital panel, and is equipped with at least two safety features. Here’s what to expect from this ceramic heater. – Tower Type. As advertised, the Honeywell HCE322V measures 8.7 x 6.7 x 21.6 inches. It’s slim, and finding a location for it should not be a problem. It fits into tiny corners. – Digital. On top of the unit is a digital panel consisting of push buttons and a digital display. These buttons allow you to adjust the following functions/features: 2 heat settings (Max Heat and Energy Save), timer (1, 2, 4, and 8 hours), and oscillation. – Safety Features. This Honeywell heater comes with two safety features. One, it has a tip-over switch that automatically turns the unit off when it’s accidentally tipped over. Two, it has an overheat protection. – Dust Filter. It also comes with a permanent filter to trap some airborne pollutants, making the air cleaner. Periodic cleaning of the filter is recommended. Here’s a summary of consumer feedback and experiences based on the comments section of a popular online retailer. – Noise. Is this quiet? When it’s in perfect condition, it shouldn’t produce any rattling or clanking sound. Overall, it’s fairly quiet for a heater. You can definitely hear the sound of the fan. Some people use this as a white noise to drown out other background sounds. – Coverage Area. This model is ideal for medium-sized rooms. Here are some of the sizes of rooms that the Honeywell HCE322V has been reported to warm up effectively: a 10 x 12 feet office cubicle/room, a 14 x 20 feet TV room, a standard bathroom, and a 19 x 12 feet bedroom. If you have a larger room/area, the Honeywell HCE323V is for you. – Performance. Some people felt that the temperature displayed on the LCD screen is inaccurate, but when it comes to this heater’s performance, the Honeywell HCE322V does what it promises to do. It heats up a room quickly and fairly well. Many buyers are happy because it puts out great amount of heat. – Limitations. Nope, you cannot program this to automatically turn itself on at a certain time. Also, although this comes with a fan, it doesn’t have a separate function that emits cold air. It doesn’t have a remote control. The Honeywell HCE322V is an auxilliary heater. It works well as a personal heating machine, one that you can take with you to your office if the main heater isn’t enough.